This issue sees the return of the Queen of Fables, a foe Diana encountered and defeated in “JLA” issues 47, 48 and 49. 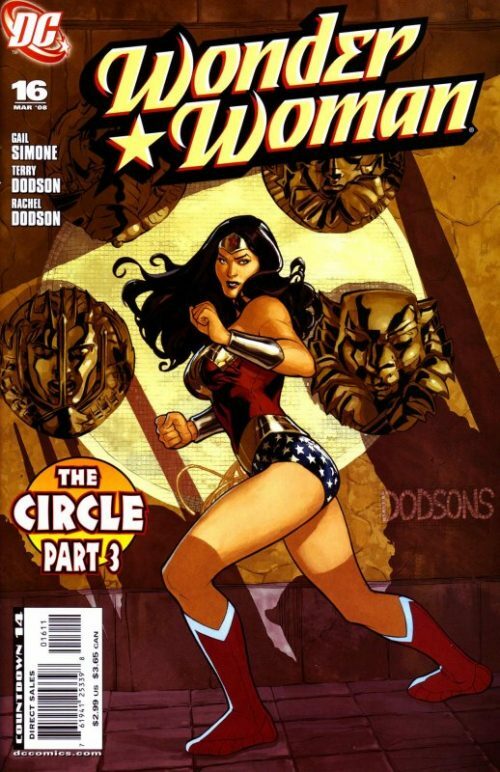 Simone cleverly addresses some of the familiar topics surrounding the Wonder Woman character, including her position as a role model to young girls and her attire. We see hints that there is more symbolism regarding the iconic costume than meets the eye. It also contains much of Simone’s trade mark humour in a story that does not take itself too seriously compared to the previous arc’s darker and heavy tone. 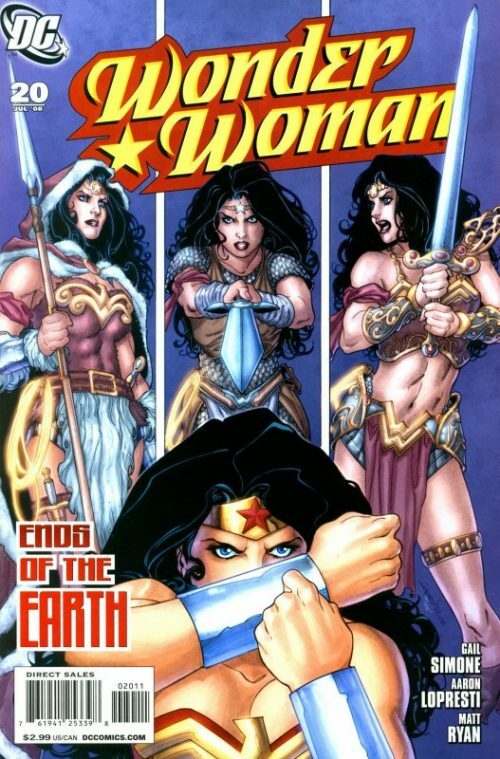 Also in this issue Diana finds herself pitted against previous incarnations of herself – in a strange merging of fiction with reality, including the de-powered Diana Prince version from the sixties and even the Cathy Lee Crosby TV Movie version, as well as the Lynda Carter’s legendary “Wonder Woman” portrayal. 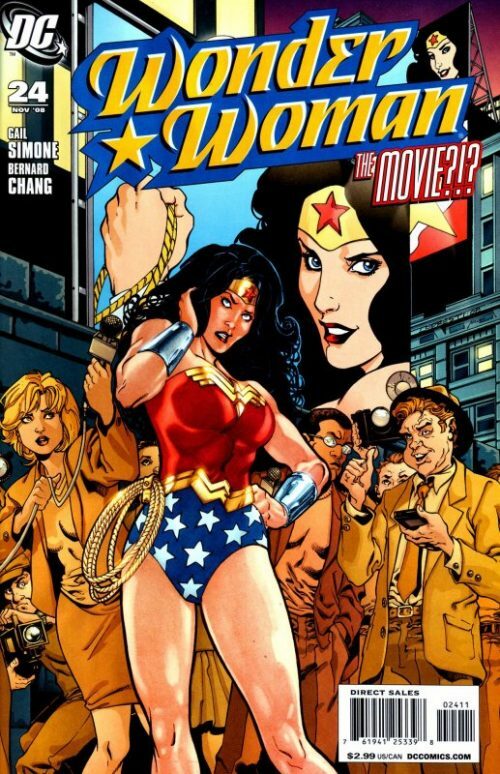 The story focuses on the making of a Wonder Woman movie at a time when many were asking why on earth Hollywood had never got around to making such a movie about the iconic Amazon Princess. Of course, fans finally got to see the heroine on the big screen in 2016 during Zack Synder’s Batman vs Superman movie as played by Israeli actress Gal Gadot. Gadot would get her very own starring vehicle a year later in a standalone Wonder Woman movie that recounted the Amazon’s origin, though it differed somewhat from the comic version. Wonder Woman and Tom travel to Themyscira on-board the Shell vessel. The Amazon Princess tries to reassure a nervous Tom about their forthcoming meeting with her mother, Hippolyta. Diana tells him that the best approach is to be absolutely truthful with the queen. 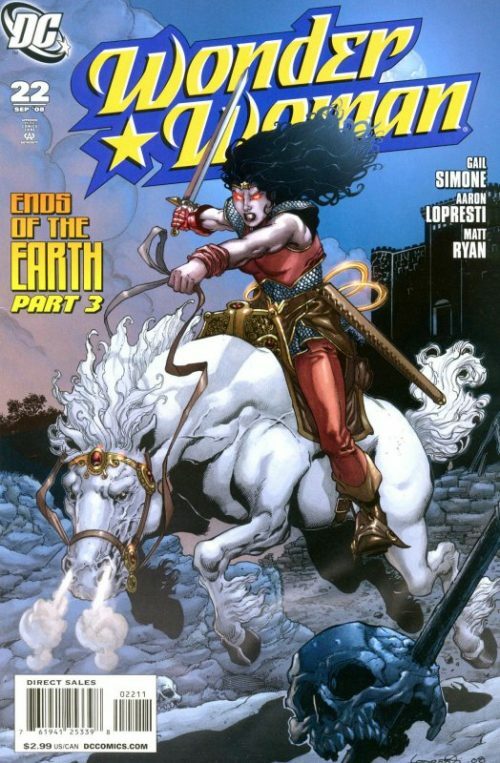 As they make land fall Hippolyta awaits astride her horse and welcomes them both. She points her spear at Tom who stares worriedly at the blade but Wonder Woman tells him that he is simply being beckoned ashore. He asks whether it is safe as he thought men were forbidden to set foot on the island but Hippolyta tells him that things have changed. He sets foot on Themysciran soil and tells the queen that it is a pleasure to be here. “Is that so? Is it really?” asks a skeptical Hippolyta. Remembering Diana’s advice he decides honesty is the best policy and replies “No. Not in the slightest”. He adds that it is still an honour though and that he had not been quite so prepared for the Amazon queen to be so beautiful. She thanks him for his kind words and asks Tom to aid her in some chores. 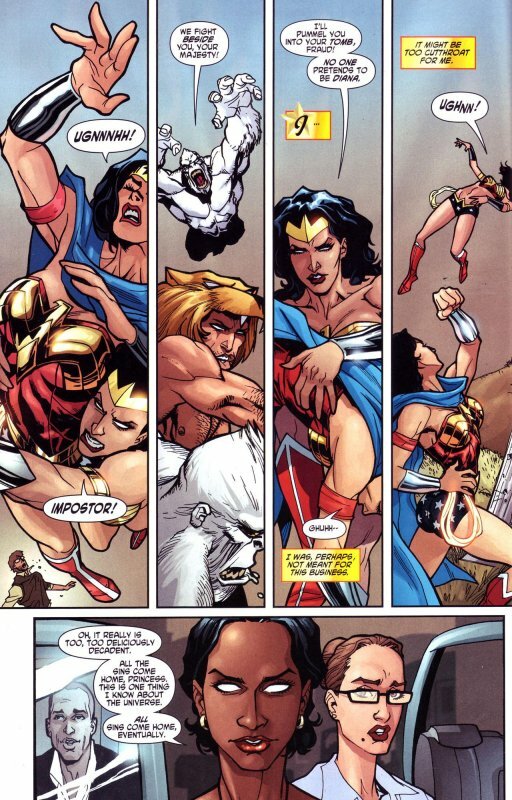 Wonder Woman asks if she should accompany them but is told that Tom seems quite capable of handling things on his own. Hippolyta leads Tom to the housing for the Royal Menagerie. She explains that many beasts live here that have passed from the rest of the world. They are safe here as contact with the outside world would be harmful. As they step inside Hippolyta hands Tom a foul smelling bucket containing last week’s slaughter and tells him that the Griffins prefer it that way. She adds that she has spoiled them over the years by hand feeding them and are perfectly safe as long as he does not make any sudden movements, sweat or make direct eye contact with them. As they stand beneath the magnificent beasts and feed the rotting meat, Hippolyta casually asks if he has made love to her daughter yet? Tom’s head snaps round to look at her in shock and immediately startles the Griffins who rear up at him! The queen holds up her hands to calm them and decides they had better leave. Once outside, Tom tries to get his breath back as Hippolyta asks him a different way. “Have you attempted to procreate with my daughter yet, Tom?”. He starts to reply ” No! No, we haven’t even…” but she stops him short, saying that there are formalities and that nothing like this has happened on this island for some time. He asks if Tom has been wed before and he responds that he has not and has in fact not been close to anyone in quite some time. Hippolyta then asks if he will protect Diana from harm if he is able and he nods, adding that is something he can promise although it is usually Diana that protects him! Hippolyta then asks one more question. “Not as a princess, not for what she can do, but for who she truly is…do you love her?”. “I do your majesty. I do” he replies. He adds that he realises the queen does not think him worthy of her daughter but to his surprise Hippolyta tells him that she does. She holds out the spear and says that it is for him, made for his hand. She explains that normally there would be an approval party but the her Amazons sisters are temporarily lost. She says that he needs a title and rank and announces that he will be called a guardsman named “Sir Thomas of…?” “Cleveland” he replies. 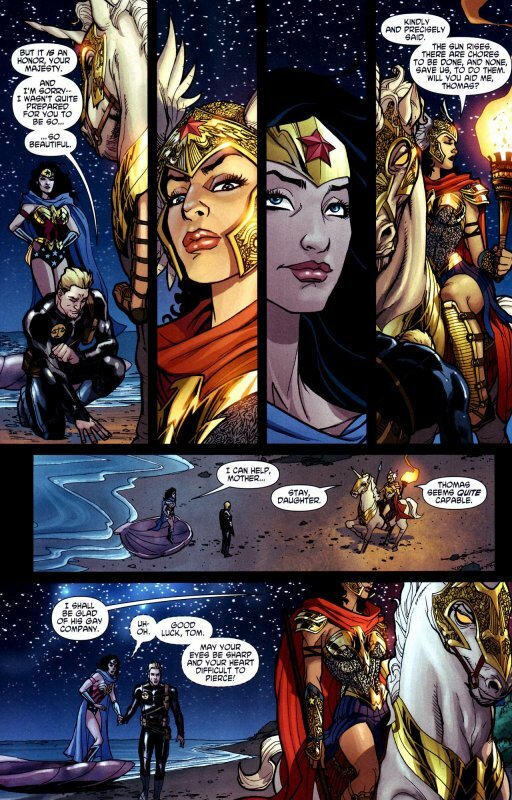 As they walk back to the beach where Wonder Woman awaits Hippolyta tells Tom that he is an Amazon now and that he must be true to his sisters for anyone of them would give their life for him without hesitation. She then places her hand on her daughter’s cheek and tells Diana that she gives her approval. “Return to his world with my blessing.” She adds that there is one more thing she requires from Sir Thomas of Cleveland. “Babies! as many as you can provide, as quickly as you can produce them!”. Sometime later in Hollywood, studio execs prepare for Wonder Woman’s arrival. They intend to make a movie about the Amazon’s life but have not sought Diana’s approval to do so. The senior executive, Laney Kirswell, is a renowned tough individual who plays hardball and is ready to counter any issue the Amazon princess may have and to provide reassurance that the movie will be a respectful piece of work. Her assistant, Cherri, googles Wonder Woman to ensure that they greet her in the approved Amazon ways. Wonder Woman arrives accompanied by Tolifhar and Rhanda and are taken into the board room to meet the other members of the team. Laney introduces Denny, the director, Cross, the writer and Allison Condero, their lawyer who will be “taking some notes”. Wonder Woman mentally warns herself to beware. As she sits down Laney explains that the Amazon’s life is public knowledge. Diana asks that if she were to state her unhappiness with the movie though..” and Laney has to admit that it would hurt the picture. Cross chips in that they totally respect the Amazons and want to make a movie that she will be proud of. He prompts Allison who reluctantly tells Diana that if she endorses the film, she gets a consultant credit and the studio donates a million dollars to the Athenian Woman’s Help Shelters. Diana ponders the offer as some refreshments including fresh fruit are brought into the room. Denny continues to explain that they want to tell a thrilling adventure story and something that will be an inspiration to young girls the world over. At that moment Allison snorts in disgust and Laney quickly apologises for the lawyer’s attitude, adding that Allison does not quite see eye to eye with the rest of the team. Wonder Woman, who had already picked up on the hostility, asks Allison to speak her mind. The lawyer proceeds to rant that Wonder Woman has no right to hold herself up as an “inspiration” to little girls. The Amazon seems to think that violence solves everything and how does wearing the American flag on her barely covered rear end act as a good message for her daughters? 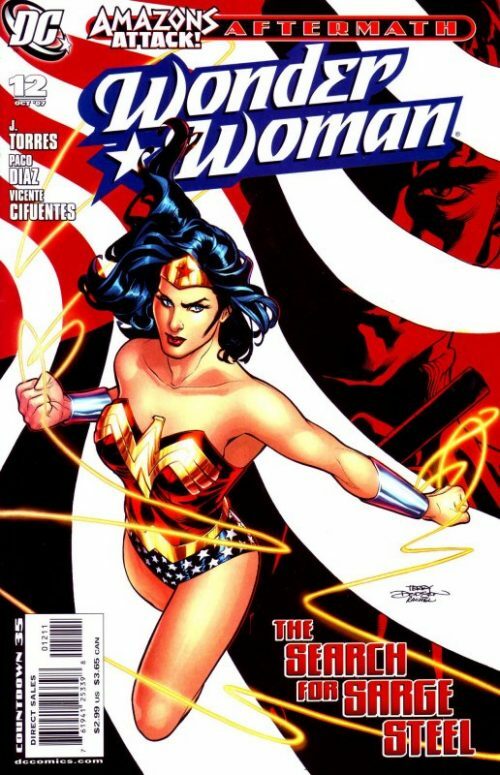 Wonder Woman smiles and takes a bite of an apple, replying that her costume does not represent an american flag and that the design and colours have meaning to her. “And would you rather I be ashamed of my body?” Allison scowls back that if she wants to look like a stripper then “be my guest!”. Laney scolds the lawyer but Diana calmly asks if she could have a few moments alone with her. A short while later Wonder Woman is given a tour of the set. Cross explains that the script does not skip over their darker part of the Amazons’ history. As they drive past a rehearsal scene where an actor playing the role of Hercules is confronting an actress playing Hippolyta, dressed in a skimpier version of her own costume, Cross asks Diana what it was like to confront the real demigod? The Amazon Princess watches the cheesy dialogue, as the faux Wonder Woman declares that she cannot love a man who has not defeated her in battle and they proceed to have a a brief skirmish. She says to Cross ” It was not like that” as the scene culminates with ‘Hippolyta’ telling her “conqueror” that she has never felt more like a woman and ‘Hercules’ replying “Wait till you see what comes next!”. 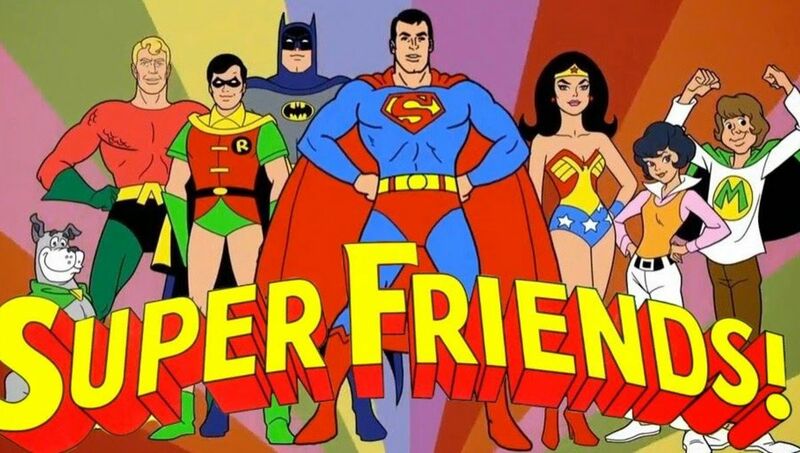 An angry Wonder Woman grabs Cross by the scruff of the neck and asks the script writer if he has any idea what Hercules actually did to her mother and almost to the entire world? “This film is cancelled. It’s over. I should never have allowed it to get this far!”. Just then Laney says that they can always adjust the script but Diana responds “Do you think these things are unimportant? Truth, and liberty…you think they do not matter?” They are mocking her mother’s life and turned her forced torment into love! Diana will not have it! She will fight them! Suddenly everyone’s eyes turn a strange white colour and Diana finds herself under attack by the actress playing ‘Hippolyta’! ‘Hercules! 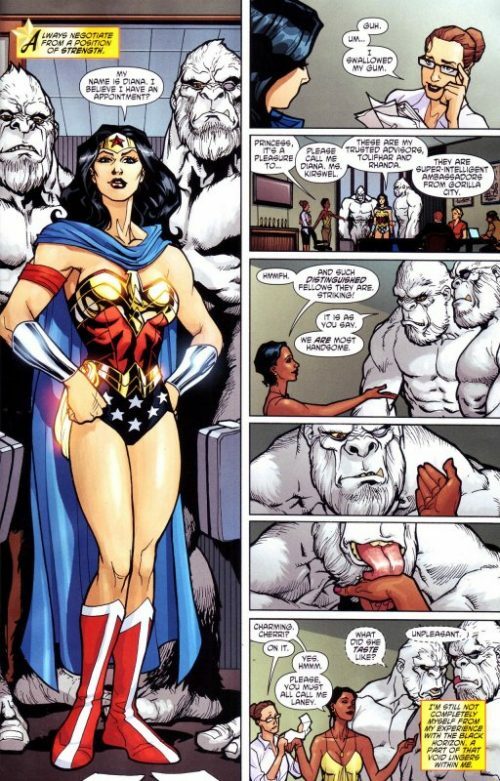 also starts to attack the two Gorillas as Wonder Woman punches the actress, sending her flying. Laney smiles that all the sins have come home. Cherri, who is the only person not affected by this sudden, almost demonic possession states in horror as a version of Diana, dressed in mod outfit, accompanied by her mentor ‘I-Ching’ appears. This ‘Diana Prince’ kicks the real Wonder Woman in the face, who quickly regains her composure and grapples the other ‘Diana Prince’ to the floor! Cherri asks Laney what on earth is going on and her “boss” begins to transform before her eyes, saying that Wonder Woman has had a lot of demons to fight. If Diana did not want to be a tortured and battered plaything for all eternity then she should not have taken a bite from a poisoned apple! Laney finally reveals herself to be none other than the Queen of Fables, as she continues to conjure of characters from past and present around the Amazon Princess. ‘Max Lord’ attacks next, but as soon as she has dealt with him, ‘Hercules’ grabs her from behind. She quickly frees herself from his grip and fells him too, but suddenly feels woozy. She realises to her horror that she has been poisoned by the apple she ate in the boardroom earlier! The nearby film crew, unsure what is going on, decide to keep filming the situation anyway. Meanwhile Cherri pleads with what was formerly her ‘boss’, asking what she has done to Wonder Woman, but the Queen replies that Diana’s real name is actually Snow White! “And she owes me centuries of agony!”. 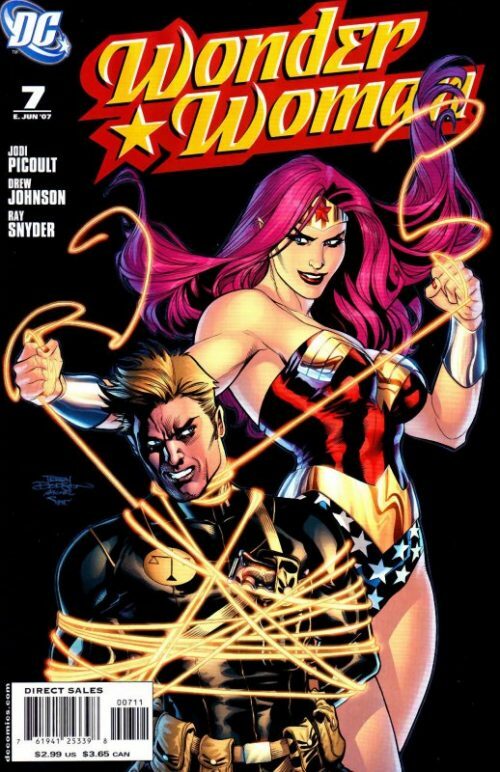 As Wonder Woman tries to clear her head she suddenly finds herself tightly bound in multiple golden lassos as she is surrounded by numerous past incarnations of herself, conjured up by her foe! A smiling Queen of Fables then adds, “But no one said she had to live out those eons…with all her limbs attached! !